While China won’t support some cases being referred to the international court, many are too quick to dismiss its participation. As the international advocacy community considers how to improve and strengthen the International Criminal Court (ICC), including a potential role for the ICC in Syria, attention must be paid to China’s position. China may be willing to help bring war criminals to justice, but it is also important to recognize when and why it sometimes will not be. In the last year, several efforts have been made to identify ways to make the ICC—which came into being in 2002—more effective and relevant. A gathering of experts at the International Peace Institute in New York tackled this issue a year ago. In March 2012, the U.K. think tank Chatham House produced a report calling for greater consistency in Security Council referrals to the Court. In October, supported by Human Rights Watch and others, the Council held a discussion on the ICC, with the U.S. and others taking stock of challenges facing the Court on problems such as Syria. Based on these factors, the default expectation is that China is more likely to be a hindrance than a help in bringing war criminals before the Court. This is especially relevant to Syria, in which France and others are contemplating whether to attempt to bring an indictment against Bashar al-Assad – China has already vetoed three draft resolutions on Syria in the Council this year, and championed dialogue with the Assad regime rather than coercion and punishment. It is unlikely that either China or Russia will consent to an ICC referral of Assad. Nevertheless, it is important not to overstate the People Republic of China’s intransigence. In the 1990s, China agreed to launch the international criminal tribunals for Rwanda and the former Yugoslavia, which were the forerunners of the ICC. Despite its interests in Sudan, Beijing acquiesced to a referral of the situation in Darfur to the ICC in 2005, which led to an indictment of President Omar al-Bashir and others in 2009. In February 2011, surprising some observers, it voted in favor of a referral of Libya’s Muammar Qaddafi. Moreover, although it is not a party to the Rome Statute, which is the international treaty laying out the Court’s functions and jurisdiction, China nevertheless has a relatively nuanced official position regarding the institution. Despite concerns about excessive prosecutorial discretion, the definition of “crimes against humanity” and other legal issues, the PRC claims to hold an “open attitude” about the Court, and does not “exclude the possibility” of one day acceding to it. 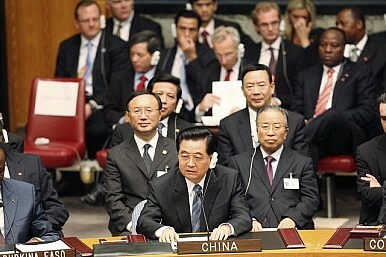 In the meantime, China has been an active observer state in the body’s day-to-day affairs at The Hague. There are also political benefits that may influence China’s position on a case-by-case basis. Specifically, supporting justice may help China to cultivate goodwill among the 121 states party to the Rome Statute and in regions, such as sub-Saharan Africa and the Middle East, in which the PRC has struggled to improve its image as a responsible power. However, this effect may be reduced by the ambivalence, or opposition, of regional organizations, such as the League of Arab States or the African Union, towards ICC involvement. China’s may also prefer to support justice at the national level, rather than by means of the ICC. Adding to the complexity of the issue is that opinion within the PRC towards the Court is divided. Some legal experts and diplomats have a relatively positive attitude, and may wish to see a stronger role for the ICC. For instance, I am told that China’s outgoing foreign policy czar, Dai Bingguo, has been receptive to ideas about strengthening the institution. However, there are also conservative voices that worry about the politicization of the Court, especially in service of Western political goals, and a weakening of the norm of sovereignty. How attitudes will align once China’s current leadership transition is complete is unclear. The international community should recognize these factors when deciding which cases to seek to refer, and in designing a strategy for reform. There should be recognition, for instance, that the unique political circumstances that led to China’s approval of the indictment of Qaddafi – including a plea by Libya’s own UN ambassador for ICC involvement, and strained relations between Beijing and the targeted individual – often will not hold in other cases, such as Syria. Emphasis on self-referrals by states that are parties to the Rome Statute may be a way to minimize concerns regarding infringements of sovereignty. Over the longer term, greater engagement with Chinese stakeholders can be useful in generating stronger political will for international justice and the Court, and to rectify misperceptions about the body’s mandate and limitations. This can be accomplished both in international civil society, which should be in regular dialogue with counterparts in China, and by stronger efforts by states’ party to the Rome Statute to lobby China (as well as the U.S. and Russia) for effective reform. It is doubtful that Xi Jinping and China’s other new leaders will take a leadership role on issues of peace and justice. Rather, they will likely take a cautious and reactive approach to foreign affairs over the next year or two. Still, China is a necessary and useful partner on these issues, and the view from Beijing should be front and center as friends of the ICC chart the way ahead.